﻿ Free Commercial Roof Inspection Lakewood Wheat Ridge CO | Western Roofing, Inc. When a Western Roofing team arrives at your building we will first connect with you or your facilities manager. We want to hear from you about existing challenges or leaks. By understanding your points of pain, we focus on immediate fixes first, and follow with an assessment for future repairs and maintenance. To provide a solid assessment and clear direction for maintenance and repair, Western Roofing provides a free commercial roof inspection. Your free inspection starts with an interior walkthrough so we can see where any leaks travel inside your building. If you have immediate points where leaks have occurred indicated by dripping or staining during rain or spring thaw, we will measure out the area and identify the corresponding location on your roof. After your building walk-through, we will get on the rooftop, measure to identify the point or points that interior water damage was identified, and work from there outward to surrounding areas. Water can travel 30 feet from a point of entry to the spot it shows up on ceiling tiles or dripping onto your floor. We will follow the path up hill, because even on a “flat” roof there is built in slope and drainage. We will look for cracks and separation around penetrations. We will inspect flashing. Some roofs have an install date stamped into the material. If there is no date indicated on your roof, or records have been lost during ownership changes, we can estimate the life of the roof based on a core sample, materials used and the natural aging and condition of the roof. 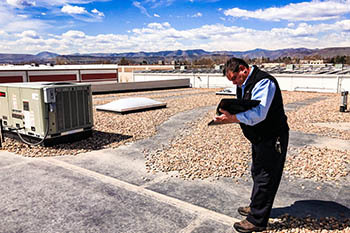 Our commercial roof inspections do more than simply identify the source of a leak. 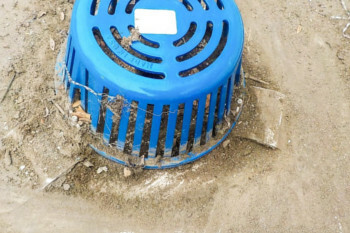 Our inspections include photographic and written documentation of the cap metal, any damage observed, previous repairs, areas in solid condition, gutters and down spouts and anything else of note. We review our assessment with you or your facilities manager prior to leaving the site, and we follow up with a free written report following inspection. We identify any immediate items to repair, three to six month and one to three-year maintenance needs so you or your property manager can accurately budget for rooftop maintenance. Start your free commercial roof inspection today. Fill out the contact form linked in the orange text, and our representative will contact you to schedule free inspection.